Can a GT350R with its 526hp / 3,700 lbs weight hang with the Ford GT and its 647hp / 3,354 lbs weight on the track? The results may be closer than you think, as seen in this video. 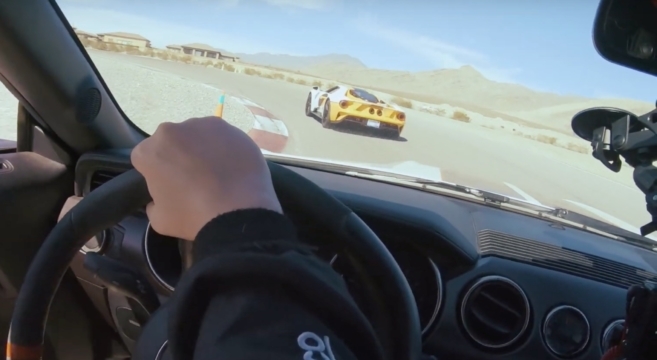 With a decent driver and twists and turns being an equalizer of the two car’s power-to-weight ratio disparity, this driver and GT350R manages to keep up with a Ford GT on track. That power-to-weight disparity shows itself on the straights, however, as the Ford GT pulls on the GT350R with ease. Check out the fun footage inside where we’re treated to both eye and ear candy from two of Ford’s most exciting vehicles.